.. creating custom maps for planning and analysis .. this section starts with the New York Times story 36 Hours in Santa Fe. We review how you can use no cost tools to develop custom maps and gain insight into demographic attributes of specific locations with intersection to intersection level of detail. 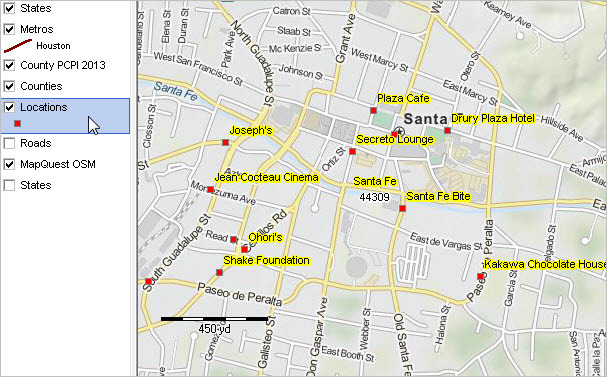 The following view shows Santa Fe locations (red markers) included in the New York Times story. View the Metro Profile for the Santa Fe, NM metropolitan area. Examine demographic trends for Santa Fe County, NM, assess the economic profile for the metro and more. View the City Profile for Santa Fe, NM. 1. Use APIGeocoder to geocode the locations based on address. 2. Add the shapefile created by APIGeocoder to a GIS project. 3. Use CV XE GIS to create mapg shown in this section and perform related geodemographic analyses. The following view shows a zoom-in to the Plaza Cafe location (see pointer in map). The identify tool is used to display a mini profile. This profile shows three attributes assigned by APIGeocoder (among others) … 1) the location is in census block 350490004001021 (blue highlight in graphic, block 1021 in census tract 000400), the street segment location is TIGERLine ID 169377560, 3) the location is on the left side of the segment. The following view shows a mini profile of the TIGERLine roads street segment where the Plaza Cafe is located. This view shows the roads layer (see in legend at left of map) checked on; streets based on shapefile are visible in the map. Add the TIGERLine roads shapefile (for any county) using the CV XE GIS Geogateway feature. This profile shows the left-side and right-side street segment high and low address range and left- and right-side ZIP code. The Census 2010 census block for the location is 350490004001021 (see above). The Census API can be used to access detailed demographics from ACS 2012 5-year estimates for the block group (BG — areas averaging 1,200 population). Median household income (item B19013_001E) $63,287. Select from thousands of subject matter items at the census block and block group levels. • How will the market for single family homes change over the next 5 years? 20 years? • How does economic prosperity in the Chicago metro compare to others? • What are the patterns in metro rental income and homeownership/vacancy rates? • How do patterns manifest themselves in different ways by county/neighborhood? • How are demographic-economic characteristics trending? We examine these types of topics in this section. Stakeholders can replicate applications reviewed here for this and other metros using ProximityOne resources. .. this section now continuously updated … see Chicago Metro Situation & Outlook; see related Illinois Demographic-Economic Characteristics. See this section as the corresponding more detailed ProximityOne Web page. This section is focused on the Chicago-Naperville-Elgin, IL-IN-WI MSA; Core-Based Statistical Areas (CBSA) 16980. It is not intended to be a study of the metro but rather illustrate how relevant decision-making information (DMI) resources can be brought together to examine patterns and change and develop insights. The data, tools and methods can be applied to any metro. The Chicago-Naperville-Elgin, IL-IN-WI MSA is shown in the graphic below. The 14-county metropolitan statistical area is shown with bold brown boundary; counties appear with black boundaries and county name labels. The thematic pattern shows a measure of economic prosperity (median household income: MHI) by census tract. Click graphic for larger view. Map developed using CV XE GIS. 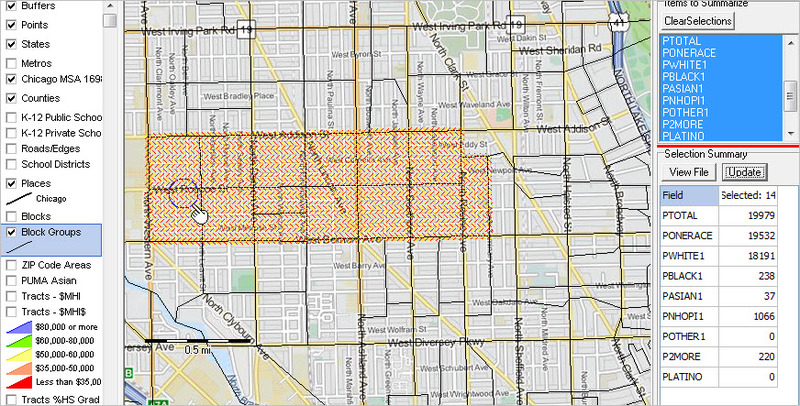 Develop variations of this map view using the Mapping Illinois Neighborhood Patterns GIS resources. The Census 2010 population of the metro was 9,461,105 (3rd largest in the U.S.) compared 9,537,289 (3rd largest in the U.S.) based on the 2013 estimate. See interactive table to examine other metros in a similar manner. Click here to view a metro by county profile for the Chicago metro. Click the county component links below to view annual county population estimates and components of change. The graphic below shows the Census 2010 Cook County, IL population pyramid. 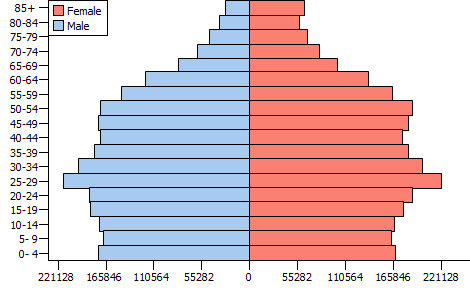 Click graphic to view as HTML section with related Census 2010 age-gender population distribution. The following view shows counties in the metro area. Counties are labeled with name; bar charts show Census 2000, Census 2010 and the ProximityOne projection to 2020. The CV XE GIS identify tool (see pointer) is used to show a mini-profile for one county. Kendall County, IL is projected to change from 115,206 as of Census 2000 to 173,343 in 2050. See more about how USA TODAY used ProximityOne projections to analyze diversity, 1960 to 2060. More about diversity below. Click graphic for larger view. Map developed using CV XE GIS. 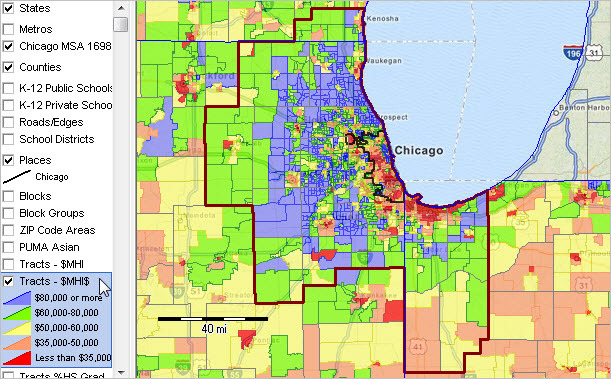 Census tracts are colored based on value of the diversity index. See color patterns assigned based on diversity index values as shown in legend at left of the map. Blue tracts are most diverse; red tracts are least diverse. Tracts shown with black cross-hatched pattern are tracts with 50-percent or more Hispanic population. See more aboutneighhborhood diversity in the Chicago area. 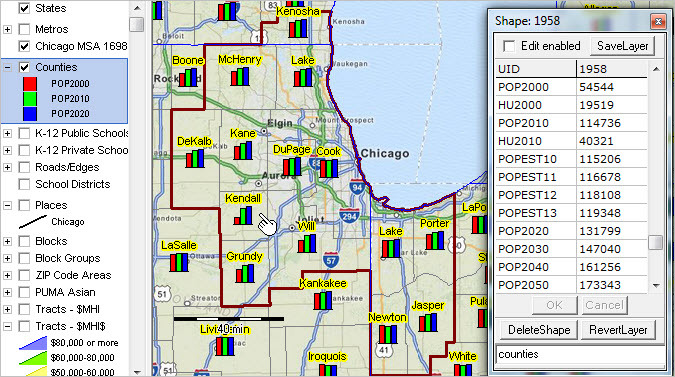 The following view illustrates how a set of block groups in Chicago can be visually selected and analyzed using site analysis tools. The cross-hatched areas are 14 block groups in a study area that were visually selected using the mouse. A mini-profile in the lower right grid shows the 14 area aggregate for selected race origin items. The total population for these 14 block groups is 19,979. Perform this type of operation for any set of block groups for wide-ranging demographic-economic measures. Click graphic for larger view. Developed using CV XE GIS. Click the View File button, the selected 14 block group records are shown in the grid below. Optionally save and output these block group records for further analysis. By definition, metropolitan areas are comprised of one or more contiguous counties. Metropolitan areas are not singlecities and typically include many cities. Metropolitan areas are comprised of urban and rural areas and often have large expanses of rural territory. A business and demographic-economic synergy exists within each metro; metros often interact with adjacent metros. The demographic-economic make-up of metros vary widely and change often. See more about metros. .. you can now create/use custom demographic estimates by Public Use Microdata Area (PUMA), state and the U.S. based on the Census 2010 Public Use Microdata Sample (PUMS) data. The Census Bureau released the Census 2010 PUMS data this week (November 12, 2014). Use custom estimates to enhance knowledge about the demographic size and composition not otherwise possible. Learn more about your markets, clientele served and previously unknown opportunities. The Census 2010 PUMS is a 10-percent sample, making the sampling rate 10 times larger that the American Community Survey 1-year PUMS data. For example, there are 135,513 unweighted person records in the Census 2010 Hawaii PUMS and 14,286 unweighted person records in the ACS 2013 1-Year PUMS. As a result, many more detailed population and housing attributes can be estimated using the Census 2010 PUMS compared to ACS 1-year PUMS. For example, using the Census 2010 PUMS, it is possible to develop usable estimates of the Native Hawaiian alone or in combination with other races population crossed by age and other attributes by PUMA … or the Asian Indian alone or in combination with other races population crossed by age and other attributes by PUMA. Public Use Microdata Sample (PUMS) files provide a way to develop custom estimates of demographic summary statistics for PUMAs, states and the U.S. Both Census 2010 and American Community Survey (ACS) PUMS files are comprised of samples of individual respondent person and housing unit records. The ACS PUMS files are released annually providing a means to develop similar custom estimates with annual updates. There are 2,378 2010 Public Use Microdata Areas (PUMAs) covering the U.S. wall-to-wall. PUMAs have a minimum of 100,000 population and where possible coterminous with a set of census tracts and county boundaries. As an example, there are 69 PUMAs that comprise Los Angeles County. See more about 2010 PUMAs. See the related Web section Census 2010 PUMS. .. Geographic Information Systems (GIS) provide flexible and powerful capabilities to combine maps with data. 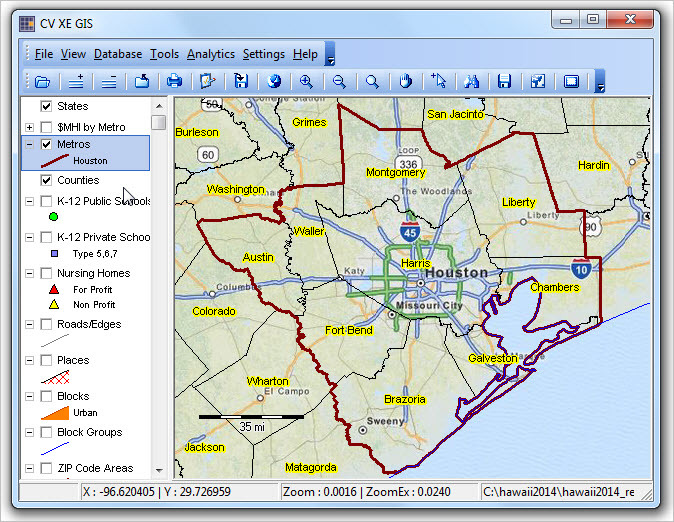 Here we review easy-to-use examples of how you can do more with GIS tools. In our increasingly data rich environment, we often experience “drowning in data.” GIS tools can help harness disparate and voluminous data and assist with data linkage. GIS provides us with a way to improve collaboration; we can more easily comprehend and understand geographic relationships and patterns among “variables.” As we reduce tabular data to visual representations, we are better able to communicate “what the data are telling us” among stakeholders and teams/committees. This second dimension, learning what the data are telling us, provides the power of creating insights for more effective decision-making. Toward these ends, GIS applications provide dynamic map atlas/reference maps, thematic pattern maps and geospatial analysis capabilities. Examples of these three types of GIS applications are provided below. You can explore these applications on your own computer and modify the applications to meet your own geographic and subject matter needs. 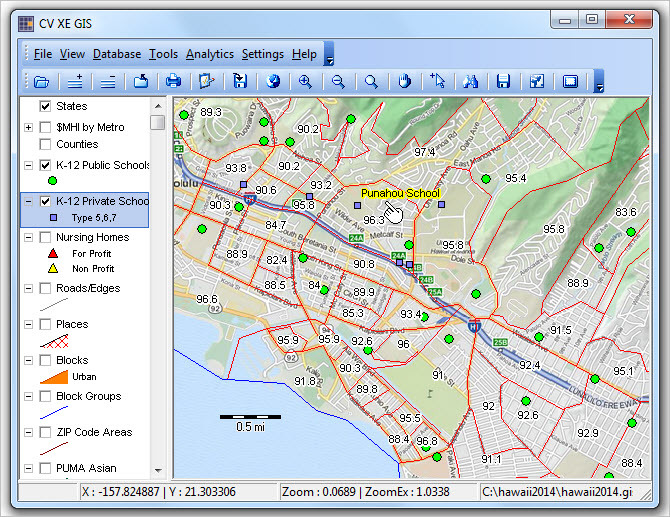 • Expand GIS Project Fileset to c:\hawaii2014. — requires ProximityOne User Group (join now, no fee). See more about this GIS Project. The start-up view (below) is a reference map of the Houston, TX area. One metro is selected using a query; counties are labeled. It is easy to see the counties that comprise the Houston metro, their names and locations. Try it yourself. Navigate to any metro. The start-up view (below) is a thematic pattern map of the 48 states showing metros by median household income. See color/value patterns in the legend at the left of the map panel. It is easy to see the how metros vary by median household income. Try it yourself. Change the colors/interval patterns. Label the metros with name. Zoom-in to any region. Add your own layers/data. This is the basic GIS project; start SiteAnalyst: Analytics>SiteAnalyst. 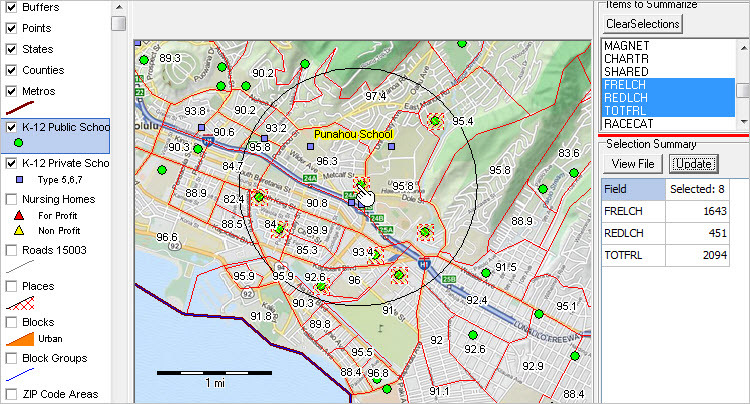 The graphic below shows a site analysis view of schools selected by a circle. Attributes of the schools to analyze has been set to enrollment by grade (6 grades K-6 — upper right panel). As the selection is made, the schools are selected and enrollment summarized/aggregated (lower right grid). It is easy to see the aggregate enrollment by grade. Try it yourself. Select a different set of items to be aggregated. Select a different set of schools. Zoom-in to any area of interest. Add your own layers/data.  how many of your existing/prospect client locations are in a custom defined geographic area — like 10 miles from a store location?  how many students are enrolled in free/reduced fee lunch programs in a selection of schools in a neighborhood/area?  What is the population of a certain age in a set of custom selected block groups in a study area?  What is the size of the Asian population in a group of selected counties? These are questions that are easily answered using GIS site analysis tools that can be challenging when using tabular data files and spreadsheets. Often the selection of the geographies (schools, block groups, counties) is more easily performed with visual GIS tools rather than codes in a list. See corresponding Web page. Mouse used to select areas; demographic profile at right of map. Above application reviewed below; emulate for your areas of interest. • output/save the aggregated data for the collection of selected objects. These operations are not specific to the Hawaii 2014 GIS project (independent of any specific GIS project) but are illustrated here in context of that project. To use this CV XE GIS feature, you must code your User Group ID (no fee, join now) in the “Key” edit box shown in the Settings>Start-Up form. This is a one-time change that enables operation of this feature. With CV XE GIS running, click Analytics>SiteAnalyst. The Hawaii2014 GIS project opens. 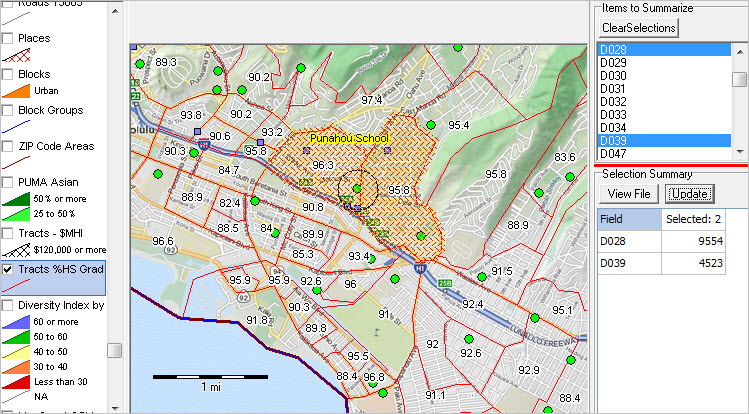 The no fee version of Site Analysis operates only with the Hawaii2014 GIS project. The following steps illustrate use of Site Analysis with the public schools layer. • click the name of the K12 public schools layer in the legend panel at left of map. … it turns blue and is the “active” layer. • the Site Analysis panels appear at right of map. Dbl-click “SCHID’. • scroll down in the upper right section and select FRELCH, REDLCH, TOTFRL (illustrated in graphic below). • in the map window, click on location shown at pointer and drag mouse to one mile radius and release. • schools intersecting with the circle are selected; their summary characteristics are shown in the lower right grid. • there are 8 cross-hatched (in map) schools selected, the total free and reduced lunch enrollment is 2,094 students. • more details about the operations are covered in Web sessions. The following steps illustrate use of Site Analysis with a census tracts layer. • click the name of the Tracts %HS Graduate layer in the legend panel at left of map. 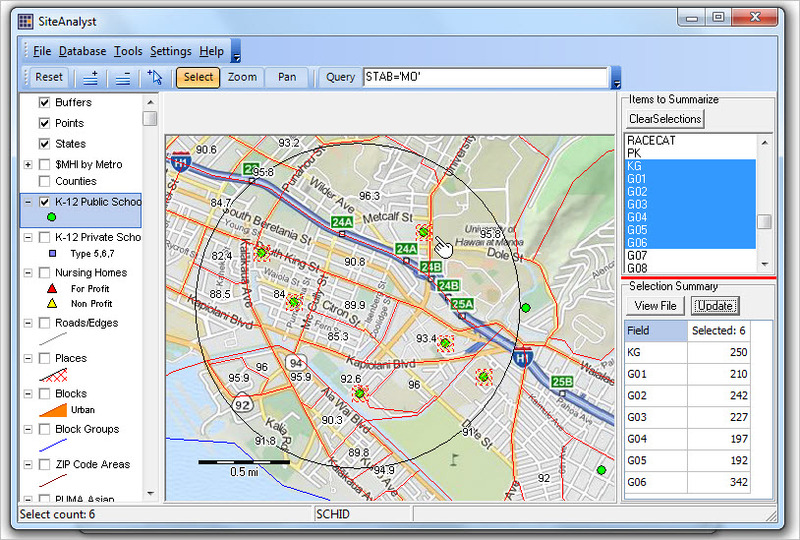 • the Site Analysis panels appear at right of map. Dbl-click “GEOID’. • scroll down in the upper right section and select D028 (total population) and D039 (Asian population). … illustrated in graphic below. … item names and descriptions shown here. • in the map window, click on location shown at pointer and drag mouse to intersect with two tracts and release. • tracts intersecting with the circle are selected; their summary characteristics are shown in the lower right grid. • there are 2 cross-hatched (in map) tracts selected, the total Asian population is 4,523. The following steps illustrate use of Site Analysis with a county layer. • click the name of the Counties layer in the legend panel at left of map. • scroll down in the upper right section and select items illustrated in graphic below. 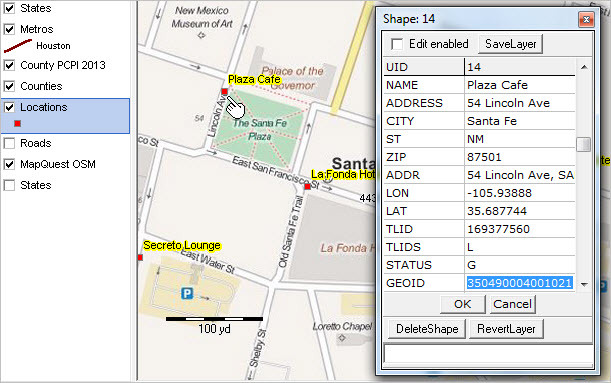 • in the map window, click on location shown at pointer and drag mouse to intersect with two counties and release. • counties intersecting with the circle are selected; their summary characteristics are shown in the lower right grid. • there are 2 cross-hatched (in map) counties selected, the total Census 2010 population was 12,828,837. When the lower right grid summary updates, the grid values are written to clipboard. The content of clipboard can optionally be pasted in spreadsheet software. An augmented view of the clipboard data for the above application is shown below. 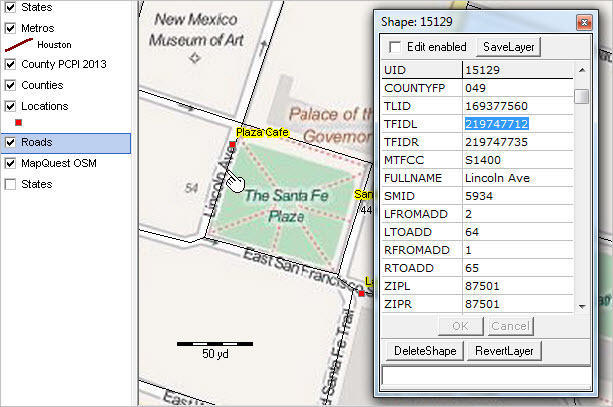 Click View File button to view the selected records (contained in the active shapefile dBASE file). The following view shows the selected records in the county application. Note that only the two records are selected. These records could optionally be exported/saved using the CopyTo button. This view illustrates use of the “Field Location Manager” (FLM) button in tool bar. Use of FLM does not affect structure of the dBASE file. Keying into a field value immediately and permanently modifies the record. Only selected features of Site Analysis have been shown here. See more information at Site Analysis operations.